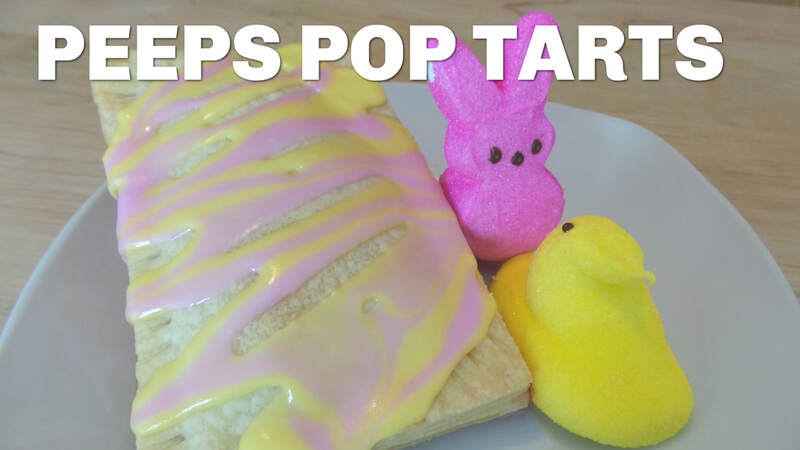 Whether you are team PEEPS or not, you have to admit they are a sweet staple for Easter. Here is a clever way to enjoy these sweet marshmallow treats. Cut out 5X3 rectangles out of the pie crust dough. I created a rectangle template with a piece of paper. You can also roll out the scraps. It is two rectangles per pop tart. I was able to make 5 pop tarts with one box of pie crusts. In a bowl place a handful of PEEPS with a little bit of butter and microwave for 20-30 seconds. Of the rectangles that you made place half of them on a parchment line baking sheet and preheat the oven to 425 degrees. Spread strawberry preserve on the pop tarts and if you want you can also do Nutella instead to make S'mores pop tarts. Then place the melted PEEPS on top of the spread. Lastly place another rectangle piece of dough on top and then pinch all four sides closed with a fork. Bake for 12-15 minutes until golden brown and turn the pan half way through. Once the pop tarts are cool completely decorate with some royal icing and even sprinkles if you want. Homemade Green St. Patrick's Day Bagels? I actually really enjoy making homemade bagels. It is really quite simple and they come out very delicious. I have made rainbow bagels and even pumpkin spice bagels(recipes on my blog). 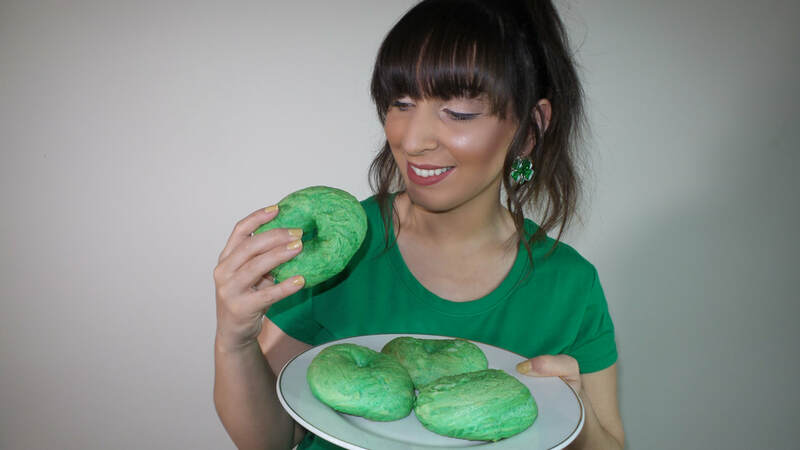 I wanted to make some green bagels for St. Patrick's Day, This is such a fun breakfast that you can make for the kids. In measuring cup mix the water and green food coloring. In a large bowl mix all of your dry ingredients and then add your green water. Mix well and add flour as you knead the dough until it forms into a large ball. Grab another bowl and coat the inside with non-stick cooking spray and then place the dough in that bowl, cover and allow the dough to rise for an hour. Pull apart about 8 pieces of dough and roll into balls. Cut a hole through the center of the dough ball and spread it out so that it looks like a ring. Next preheat your oven to 425 degrees. While the oven is warming up, boil the bagels in water for just 1 minute or so. Then place the bagels on a parchment paper lined baking sheet. Bake the bagels for about 20-25 minutes in the oven. 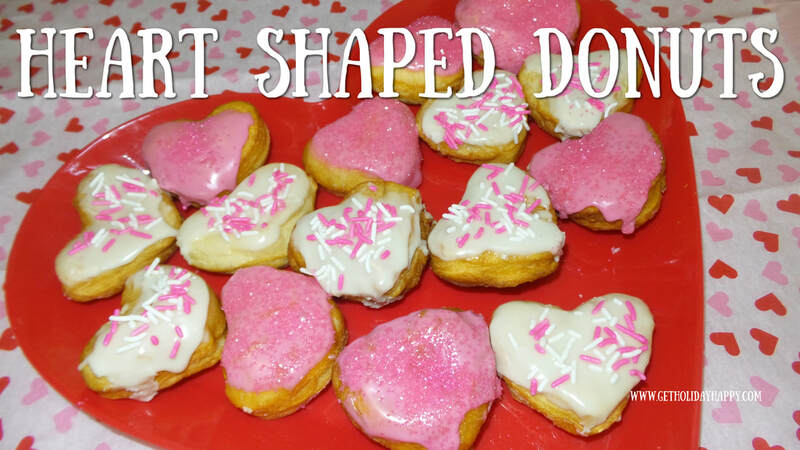 Making heart shaped donuts for Valentine's Day is actually super simple. 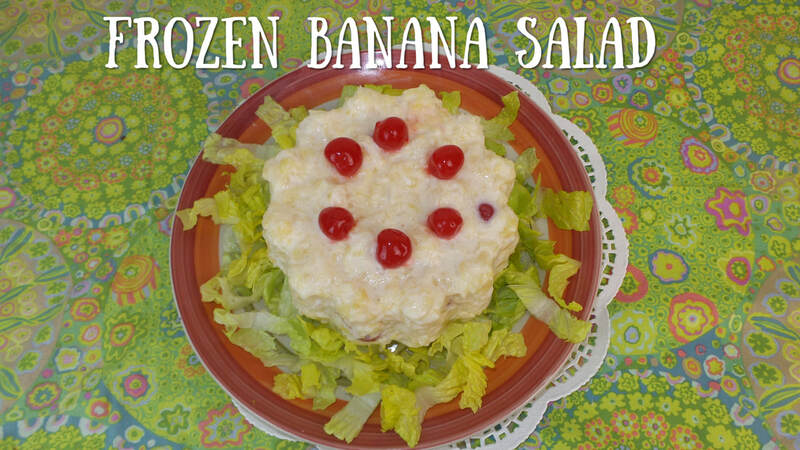 ❤ This is a fun and easy recipe that the kids can help make. Decorating you can use pink food coloring and some Valentine's Day sprinkles. Open the can of biscuit dough and roll each piece with a rolling pin. Then cut out the heart shape with the cookie cutter. I was able to make over a dozen with one can. Pour about an inch or two of vegetable oil to a pot. Once the oil is hot drop each donut into the oil and fry for a minute or so until golden brown flipping half way through. Allow the donuts to cool completely. In a bowl mix the icing ingredients. For different colors, pour some of the icing into separate bowls and add food coloring. I did pink and white icing. Dip your donuts into the icing and sprinkle with some festive sprinkles. 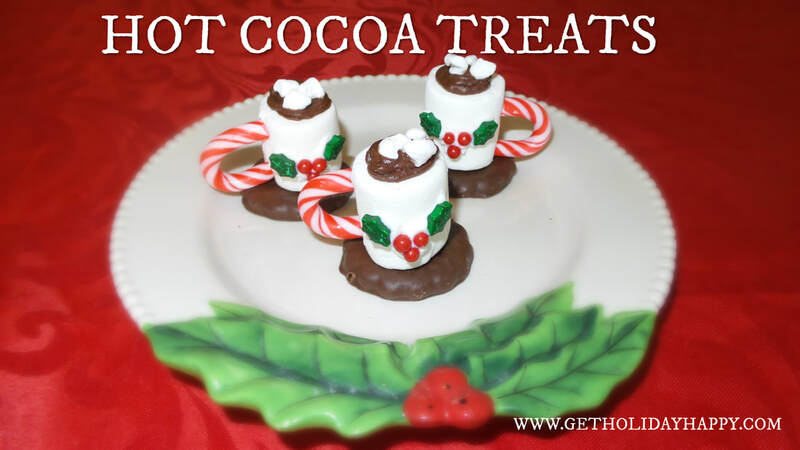 These are super cute tiny Hot Cocoa Treats that are fun to do with little ones. 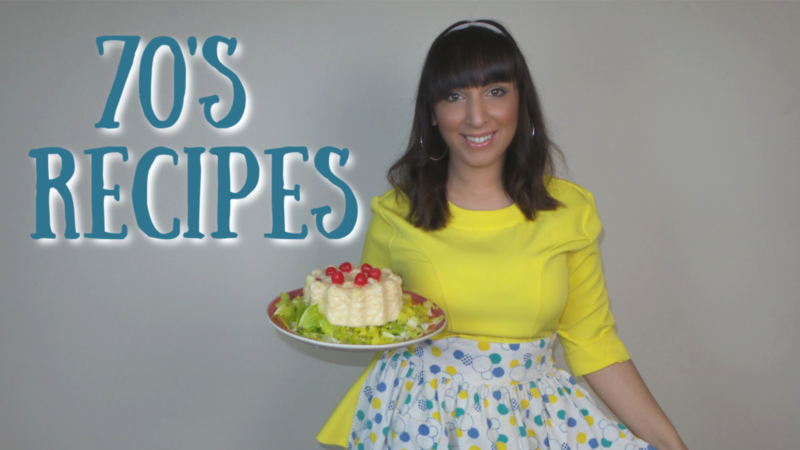 They call for just a few ingredients and come out super adorable. First cut the curve part off of the mini candy candy. This will be the handle of your hot cocoa cup. Then line the candy cane handle on the side of a large marshmallow and cut two slits with a knife and insert the ends of the candy cane into the marshmallow. With your white frosting embellish the front of the marshmallow. I chose to use some holly sprinkles. Next, glue your marshmallow to your cookie saucer with some of the white frosting. Then pipe some chocolate frosting on the top of the large marshmallow. This will be the hot cocoa. Lastly, take your mini marshmallows and cut them up into small pieces(I used kitchen scissors) and place on top. There you have it, a mini Hot Cocoa Treat! Enjoy! 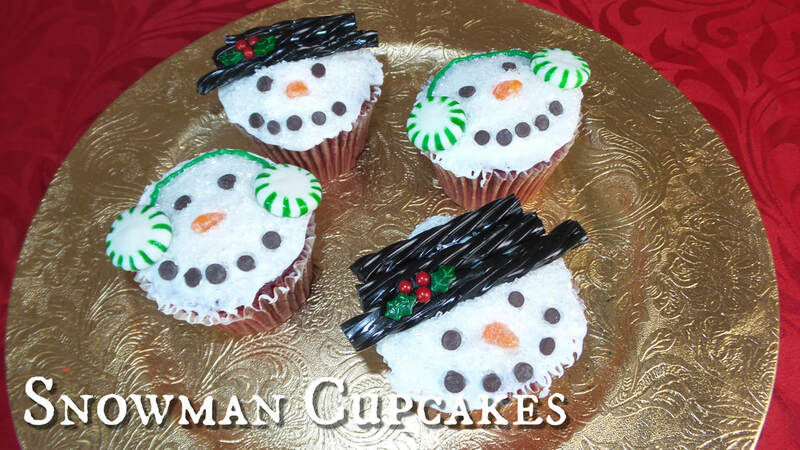 How adorable are these Snowman Cupcakes? ⛄ They are so simple and fun to make. These cupcakes are great for the kids to bring to school for their classmates or for a Holiday party. Frost the cupcakes with the white frosting and then cover with the white sparkling sugar. I just poured the sugar on a plate and rolled the top of the frosted cupcake in it. To make the cute top hat I cut the black licorice into pieces. I used three. I found some holly sprinkles and decided to glue that on the top hat with the black frosting I already had on hand. This is totally optional. For the eyes and mouth of the snowman use the mini chocolate chips and insert the tip of the chocolate chip down. Cut a small sliver of the orange slice candy for the carrot nose. To make ear muffs I put a round green peppermint on each side of the cupcakes and then connected them at the top by drawing a line with the green gel food coloring. You can use whatever color or round candy you want to make the ear muffs. Choose your pie. I opted for apple pie because that is my husband's favorite. So I went ahead and made a homemade apple pie. I actually used this recipe from Pillsbury. Then I purchased some additional refrigerated pie crusts from my local grocery store. I allowed it to get to room temperature for a few minutes. Grab a circle cookie cutter(or make a pattern out of paper/thin cardboard) and this will be the body of turkey. I then cut out a pattern on thin cardboard for the head and the feathers(I made small and large feathers). Begin to cut the shapes out of the pie crust. I added extra detail to the feathers by cutting slits with a knife and using a toothpick to make an impression in the center. 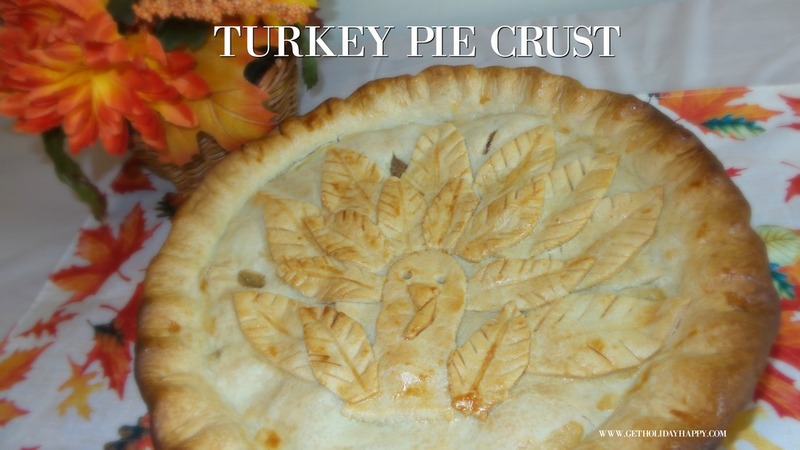 Next dab your crust pieces with water to act as glue and begin to assemble your turkey on the pie crust. Don't forget to add a beak and the "snood" of the turkey. I also poked two eyes with a toothpick. Since I made an apple pie, I made a few slits in the crust to allow steam to come through while baking. Lastly, apply some egg wash and bake. It is amazing what you can do with a pie crust. You can make all sorts of fun and creative shapes. Give it a try! 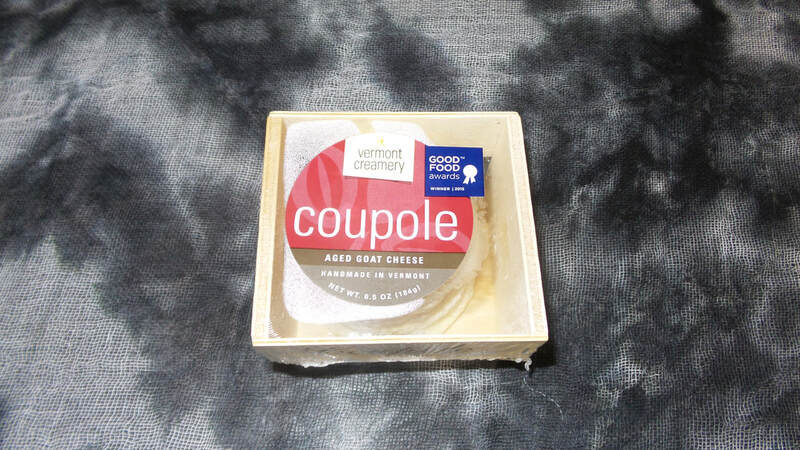 Planning a Halloween party appetizer just got simpler. Did you know Stop & Shop carries unique Halloween themed cheeses? 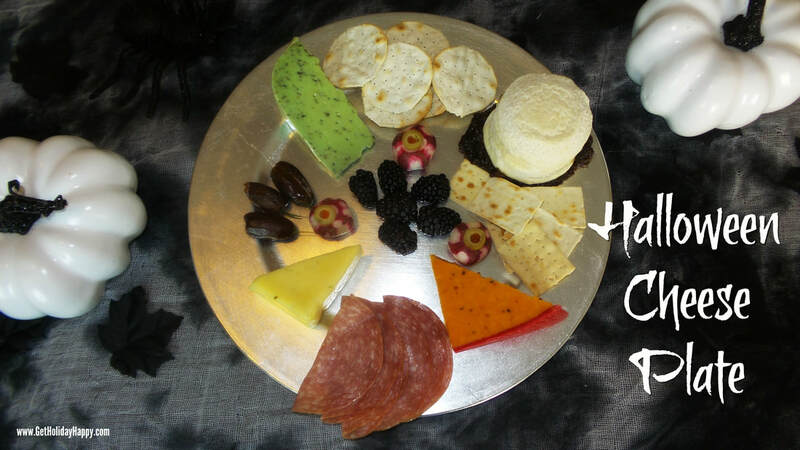 I am going to show you how to make a delectable Halloween Cheese Plate that is sure to be a crowd pleaser! 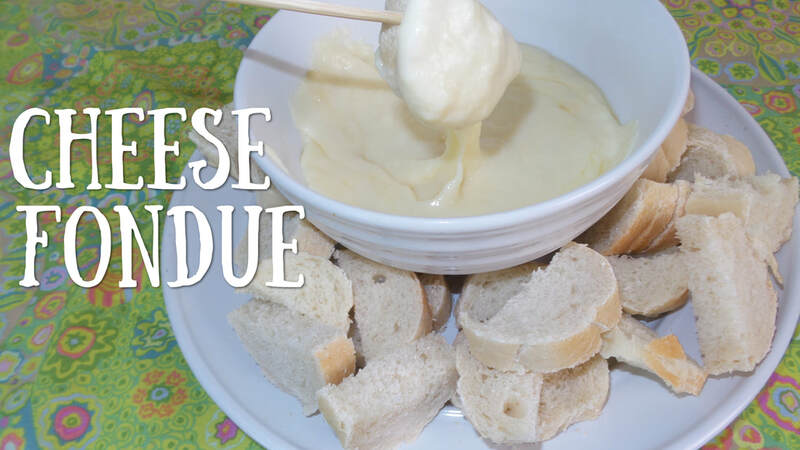 Cheese plates are fun because you can use a variety of tasty foods. You can include cheese, crackers, meats, nuts, fruits, olives, spreads, etc.. For mine I used 4 cheeses, black raspberries, salami, crackers and a fig spread. For a special spooky touch I made edible cockroaches using pitted dates stuffed with cream cheese and slivers of green onion as the antenna. For a ghoulish embellishment I also made eyeballs using red turnips and olives. 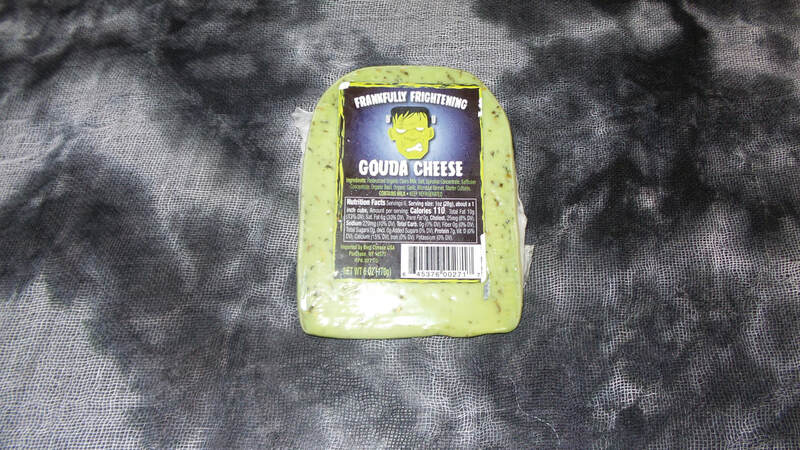 Here are the four Halloween themed cheese you can find at Stop & Shop! It looks like a brain! I mean this one just screams Halloween. 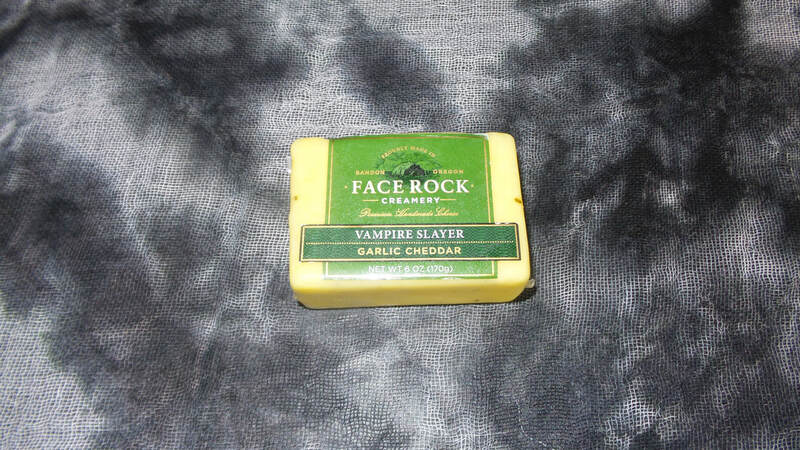 Garlic keeps vampires away and tastes delicious! Stop & Shop makes party planning so easy. 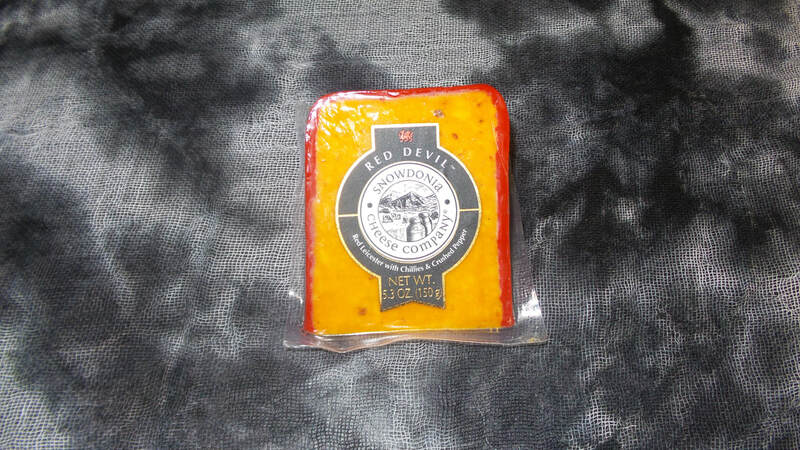 Who doesn't love cheese? 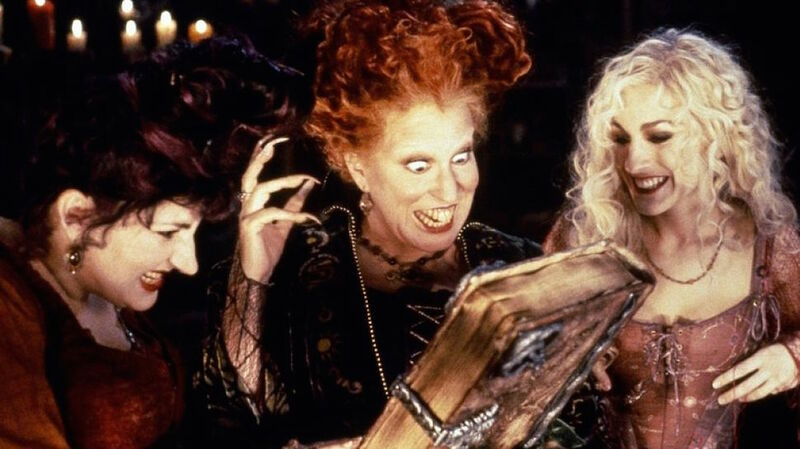 I am a HUGE fan of the Halloween film Hocus Pocus. 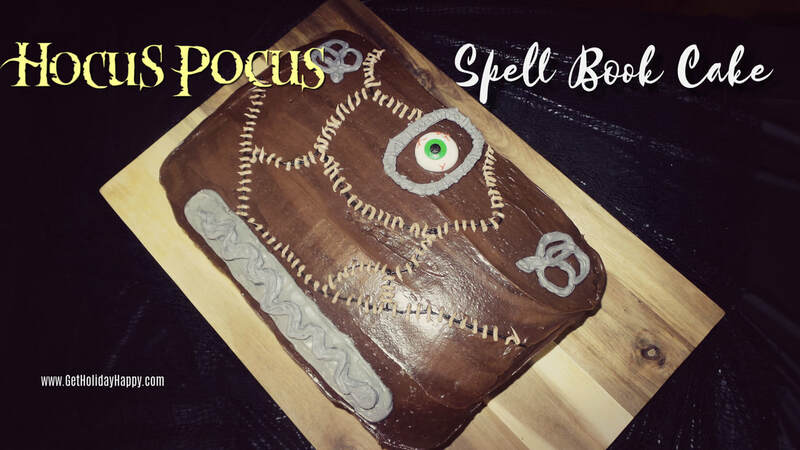 To celebrate the 25th Anniversary of the film I decided to make the iconic Spell Book seen in the film into a cake! You will see so many versions of this on the internet but I swear mine is the easiest. No fondant required! Stack the cooled baked rectangle chocolate cake on a board/tray with chocolate frosting in between the layers. Then frost the entire cake with chocolate frosting. Put some white frosting in a pipette bag and frost lines on 3 sides of the cake to be the pages of the Spell Book. 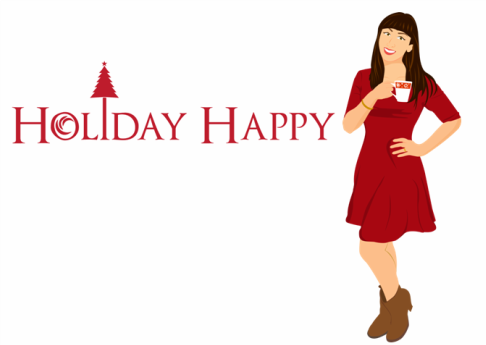 Now it is time to start decorating and making the embellishments. Melt the white and black candy melts according to the directions. Then place into a pipette bag and pipe a long snake shape and some small coiled snake shapes like how you see on the book onto some wax paper and allow to firm. I also did the metal latch/buckle you see around the eye. I used the image below as reference when I made my cake. Make some gray frosting(mix the white and the black) and pipe a long rectangle on the front side of the book. Then place your long snake you made out of candy melts on top of that. Place the gummy eyeball on the other side and place your round candy melt buckle piece around that. Then on opposite ends of the eyeball place your candy melt snake embellishments. Next pipe lines with the black frosting of where the stitch work is on the spell book. Mix some of the chocolate and white frosting to create a light brown color and draw small lines as stitches over the black lines you drew. 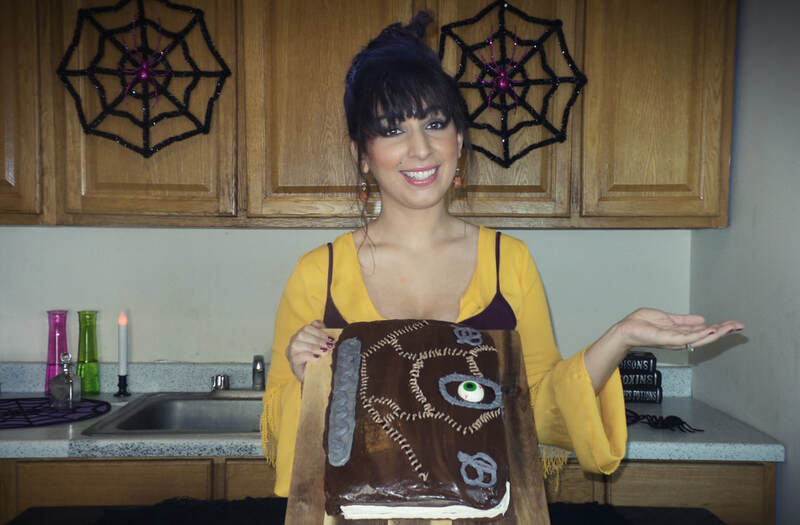 With just some frosting and creativity you can easily make a Hocus Pocus Spell Book Cake at home! Start by placing the guacamole on a tray and shape into a square. 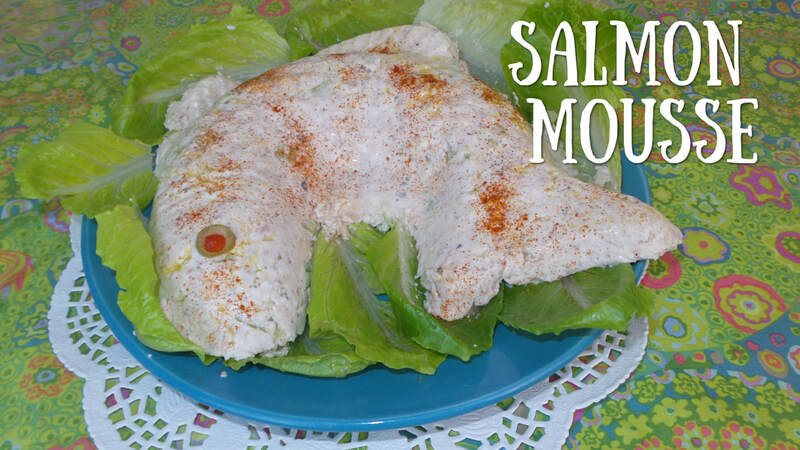 Then place some sour cream in a sandwich bag and cut off the tip. Pipe two circle for the eyes. Then slice a black olive for the pupils of the eyes. 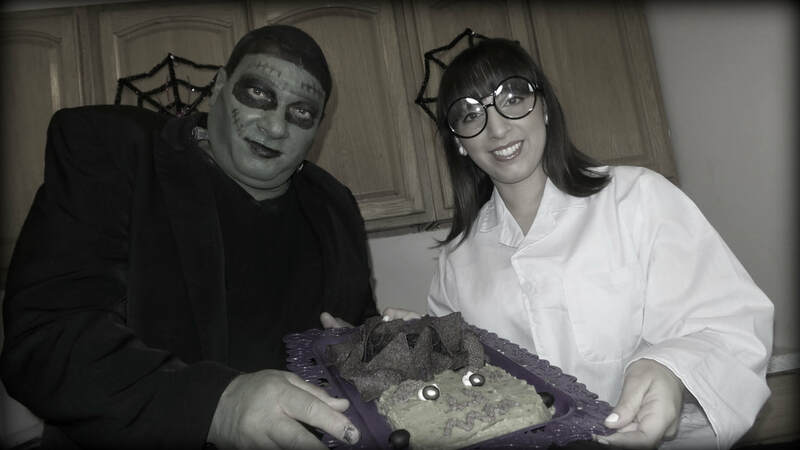 Next take two whole black olives and place on each side as the "bolts" of Frankenstein. Then take your refried black beans and pipe it out of a sandwich bag to make the nose, mouth and stitches. 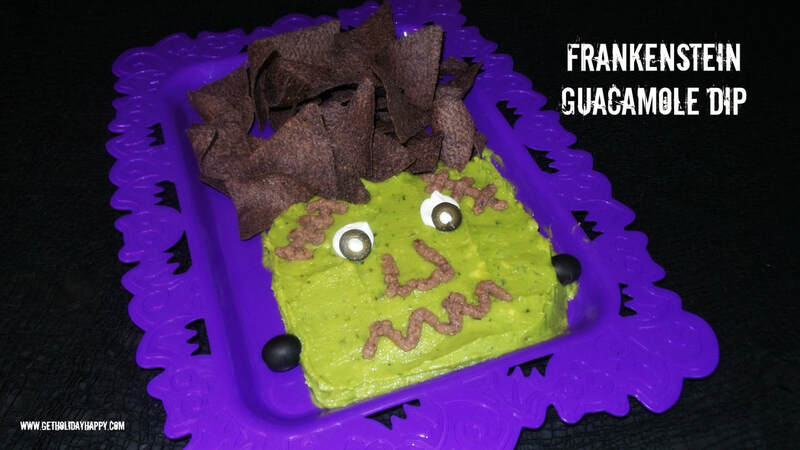 Lastly, place the blue corn tortilla chips on top as the "hair".